We have partnered with RideTo to offer advanced safety training packages for riders to learn improved handling ability, awareness and knowledge, to improve safety and reduce accidents. This includes CBT training. Awareness and anticipation is the key riding safely. If you can get inside the minds of the other drivers around you then you are one step ahead and that makes all the difference. Being seen is one of the most critical elements especially when you are new to riding. The rider and the scooter should aim to be as noticeable as possible which means wearing bright and/or reflective clothing, keeping lights on & having a noticeable colour scheme for the electric scooter. If you can’t see the driver’s eyes in their mirrors then they cannot see you. But, even if you can see their eyes always assume that they haven’t seen you and ride accordingly. Safety gear is critical. Gloves, jacket and helmet are the absolute minimum gear to wear. The first thing that goes down when you have an accident is usually your hands. The next is usually your arms or elbows, hence the jacket and then it’s your head. Although open helmets look cool full face helmets protect your face and chin much better in an accident. Gloves, jacket and helmet are the absolute minimum gear to wear. Having the road take the skin off your hands is no fun, it’s very painful and very inconvenient. If this happens to you there will be very little you can do with your hands for a few months. Most likely you’ll need someone else to help you with everything i.e. washing yourself. Simply wearing gloves makes all the difference and can save yourself a lot of pain, trouble and embarrassment. Gloves don’t have to be big and cumbersome. For most urban riding a small, light, stylish and easy to put on pair are the way to go, but they do need to fasten securely around your wrist so they stay on in an accident. Weather plays an important role in being safe. 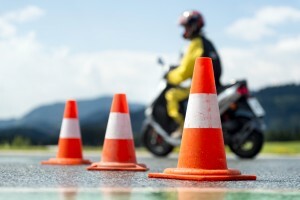 Electric scooters can be ridden all year round, and riding in the rain is fine, but be aware of road conditions as it tends to get very slippery especially on the white lines. It’s a good idea for the driver to carry a small set of light waterproofs in the box under the seat if there is a chance of rain. Riding in wind is fine too, though it can be quite unsettling when being hit by a big gust. Handling wind just comes with practice. However, learning about counter-steering helps a rider feel much more in control in these situations. Riding in both heavy wind and heavy rain is challenging even for an experienced rider.